It began as a visceral response to the terrible death toll of the First World War, but for Canadians, Remembrance Day has evolved into a tribute to all military dead and a celebration of the Canadian Forces in general. The victory of 1918 came at a heavy cost. From a population of about 7.8 million, Canada had put about 620,000 men and women into uniform during the war. Almost 10 per cent were lost. "With some 60,000 Canadians killed, the war produced a profound sense of loss in a country whose greatest military tragedy to date had been 267 dead in the South African War of 1899-1902," the Veterans Affairs Department says. In 1919, there were calls for some sort of commemoration to mourn the dead and pay tribute to the hundreds of thousands who fought. That year, King George V urged that people observe two minutes of silence at 11 a.m. local time across the Commonwealth and Empire. It was first called Armistice Day, recalling the ceasefire agreement of Nov. 11, 1918, that silenced the guns after more than four years of carnage. 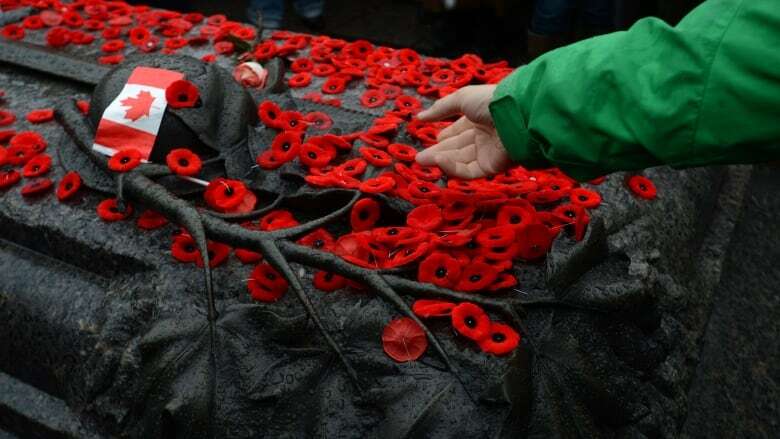 In Canada, from 1921 to 1930, Armistice Day was observed on the Monday of the week in which Nov. 11 fell. But that Monday was also Thanksgiving and many veterans were upset at the combination of a solemn commemoration and a harvest celebration. As memorials and cenotaphs were built in cities, towns and villages across the country, many gathered there for Nov. 11 commemorations, holiday or not. At its founding convention in Winnipeg, the Canadian Legion passed a resolution affirming that Armistice Day should be Nov. 11 and began lobbying Parliament to enshrine the date in law. In 1931, a British Columbia MP, Alan Neill, introduced a bill to fix the date as Nov. 11 and rename it Remembrance Day. Also that year, the observance of Thanksgiving was moved to a Monday in October, and in 1957 the date was fixed to the second Monday of the month. Remembrance Day is a statutory holiday for the Canadian federal government as well as in British Columbia, Alberta, Saskatchewan, New Brunswick, Prince Edward Island, Newfoundland and Labrador, Yukon, Northwest Territories and Nunavut. New Democrat MP Dan Harris has a private member's bill before the House of Commons which would make Remembrance Day a national statutory holiday. The bill received second reading, or approval in principle, on Wednesday. The red poppy, the ubiquitous symbol of remembrance which blossoms on Canadian lapels every November, was forever linked to the First World War and its casualties through John McCrae's poem, In Flanders Fields. But its use was first championed by an American woman, Moina Michael who was entranced by McCrae's poem and led a successful campaign to have the American Legion adopt the poppy as an official symbol of remembrance in 1920. It soon spread to France and by the following year it had also been adopted in Canada, Britain and Australia. In 1939, the towering National War Memorial in Ottawa was officially opened by King George VI. The cenotaph to commemorate the dead of the First World War was unveiled just months before the outbreak of the Second World War. It now bears the dates of both those wars, as well as the Korean War. The Conservative government has said it wants to add the dates of the Afghanistan War as well. In May 2000, the bronze and granite Tomb of the Unknown Soldier was added to the foot of the memorial. The remains of an unidentified Canadian were taken from a military cemetery near Vimy Ridge in France and re-interred in the tomb in a solemn service. The centrepiece of Remembrance Day now is the main service held at the national memorial in Ottawa. The televised ceremony includes the Governor General and the prime minister, as well as the Silver Cross mother. She is selected by the Legion each year to represent all parents mourning the loss of a child in uniform. Crowds at the service can run into the thousands and the ceremony has become as much a tribute to those in uniform as it is to their dead. As the ranks of Second World War vets dwindle — the youngest are approaching 90 — men and women from decades of peacekeeping missions and Afghanistan step up. The war memorial came into sharp focus last month when a ceremonial guard at the Tomb was shot and killed by an assailant who attacked Parliament moments later. In the aftermath, hundreds of people went to pay their respects to the murdered soldier and left the Tomb piled with bouquets, poppies, photos, poems and mementos, including a can of beer.